An up week on all three indexes. The Solo Blog Index rose 6 points as JaimeleParfum came roaring back from last week’s big loss. We have reluctantly delisted Tuileries as it went a second consecutive week with no measurable Alexa ranking. In the absence of numerical data we can no longer keep the site on the SBI. We wish blogger AlbertCan all the best. The SBI has been recalibrated to reflect the 18 remaining solo blog sites. 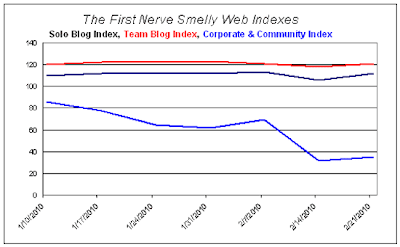 The Team Blog Index took back last week’s 3 point loss, led by an 8% rise at NowSmellThis. Led by a nice gain at TheDryDown, the Corporate & Community Site Index picked itself up off the canvas following last week’s spectacular 38 point collapse. Sniffapalooza, which was the big mover in that event, slid another 1% this week.